The President of the State of Palestine Mahmoud Abbas met with the President of Bolivia Evo Morales on September 23, 2014 in New York President Abbas thanked President Morales for Bolivia's solidarity and political action taken on the Question of Palestine, and particularly its recognition of the State of Palestine and strong position of support during the latest Israeli aggression against Gaza. President Abbas expressed his willingness to strengthen the bilateral Palestinian – Bolivian relations as well as a greater Latin American involvement in the upcoming political efforts to end the Israeli occupation. President Abbas stressed that for many years Palestine has been a gateway for friendly nations to expand their relations with the rest of the Arab world and that this would not be the different in the case of Bolivia. Finally, President Abbas announced the planned opening of an Embassy in La Paz. Bolivia has committed its support to the opening of a Palestinian embassy in their capital. 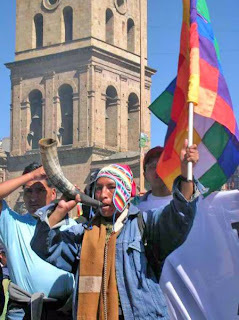 Bolivia is a country that integrated thousands of Palestinian immigrants into their social fabric, people who have contributed to the economic, cultural and social development of Bolivia. Palestine is deeply thankful for the treatment and the status given to its Palestinian community in the South American nation.